First draft for nibenese tattoo proposal. Split into a class system again for easy reading but might just organize them into style groupings as things tend to overlap atm. Working-class: Designs for these tattoos should include natural flowing curves and crude, sometimes primitive imagery. The Imperial elite understand and encourage obscure symbology and consider the working-class practice of wearing physical forms of the divinities a distinct misunderstanding of their Mystery. Totem cults: Most animal cults present during Allesian rule have survived in some small way into the 3rd Era. Villagers outside major cities and towns cover their bodies in imitation of their spirit animals. Tiger, Eagle and Dragon cults are strewn throughout the jungle-river villages of the east. The Mori Cult is the only one sanctioned to wear the face of the sacred Bull in the Empire, and membership is a matter of heritage. Plantation workers: Most rice paddy workers will tattoo themselves with depictions of the various Sky spirits (who are these? ), along with the divine Kynareth. This is believed to encourage good rainfall for their crops. Some plantation owners also worship Morihaus, and rumors are spreading of extra-legal thu'um practices being used to obtain large monopolies on the cultivation of rice. Citizens: Most City workers (accountants, lawyers, etc.) give praise to Peryite and tattoo the False-Worm about their face to bring order to their day-to-day lives. His widespread worship is an effort to unvillify some of the Princes from their demonic appearance in Oblivion (see this thread). Others are members of the Vaernimite Cult of narcotics and tattoo themselves accordingly in imagery meant to indicate who they belong to. An invitation to indulge and a warning not to cross them. Working-class tattoos should have a yellow base color. Middle-class: These designs should introduce lines that bend at an angle for a more mechanical look. Depiction of a gods physical form should be limited and symbols should be used in place. Merchants: All registered merchant-nobility are under contract from the Order of Zenithar and give praise to the commerce god as the idealistic representation of honest profit. Though most choose to forego the anvil for the Bittercup symbol of Clavicus Vile, who is the embodiment of "realistic [amoral] methods in business and commerce" in the east. The Nine Orders (the Imperial Cult): Eastern priests pledged to a single god believe that tattooing Divine symbols about their face and body will allow them to better meditate on the obscure Mysteries of that Order. The exact beliefs concerning tattoos differ by branch; the Dibellan priests see tattoos as works of art that bring a physical body closer to the ideal of divine beauty and thus closer to Dibella herself. Middle-class tattoos should have a blue base color. Cult of the Ancestor-Moth: With roots in pre-Alessian rule, the Moth Society is the oldest faith of the Imperials and the only totem cult in the east to find purchase in all classes of Imperial society due to their intimate relations with the Silk Weavers guild. The cult worships their ancestors in the form of silk garments spun from native gypsy moths and many choose, along with the more obvious imagery of moths, to tattoo their entire bodies with genealogical patterns. Some members of the Weavers guild will tattoo imitation scars of the Magnaner's Canker, a disease with strong religious ties. Should follow a working-class style. Upper-class will be written up later and I'll sketch some tattoo designs to better illustrate the stylistic differences between classes. Input welcome. Looks great. I'm a little tired right now, so I'll just post some things I had lying around that I think are relevant. These are unfinished and, as always, open to criticism and discussion. Note: I've called these cults "societies" as a way to distinguish them from the Orders of the Imperial Cult and the random cults and minor deities. I think it better represents the more political and social role these cults play in the lives of their followers. The spirit of prosperity, virility, fertility and defense of the realm. The oldest and most widespread totem society in the Niben, predating the Marukhati and in many ways the instigator of the totemic phenomenon. The Bull is most popular among the Niben's rice farmers, where often entire villages are members of the society. Virtually everybody in the Nibenay is involved with the Society of Bulls in some way, although many of the upper classes find him beneath their standing. A conservative spirit, allies to the cause of the Emperor and in opposition to what is seen as the perfidious influence of the court, administration, Elder Council and local rulers. The Bull Society is most popular in the farmland surrounding the Imperial City and towards Cheydinhall. The most famous tradition is that of the village bull: the strongest and most beautiful bull of the village is chosen as its defender, decked out in gold and jewels, posted on the best fields, and cared for by the community as a whole. If the village suffers some terrible misfortune, however, the bull may be sacrificed and an elder will try to read the portents in its remains. Urban neighborhoods practice a similar tradition, using a wooden bull or a painting of a bull in a prominent location. Gifts and sacrifices are placed at the foot of this image, and if the neighborhood suffers misfortune, the image is defiled. The Bull cult has close ties to the small, but powerful Priesthood of Morihaus in the Imperial City. The Hour of the Bull is noon. (each society having an "hour" is something that could influence quests, blessings etc., and plays into the low-key approach these cults would have. 90% of the time the priest of the Bull is just some random guy, but when you visit him at the right hour a set of equipment is added to his inventory and he is decked out in an imposing Bull mask and robe and his dialogue is different. A nice detail, at the least). Note: I made the Society of Bulls a rather low-grade farmer's cult, which in hindsight might not match well with the divine aspect of Morihaus. Still, if we elect one cult as more sacred and privileged, I think it should be the Dragons. The spirit of history and the dead. Popular among storytellers, scribes, scholars, silk-weavers, and morticians. Adherents on the whole prefer moth-burial. Like the Bull cult, the Society of Moths predates the Alessian Reforms, and grew as a public alternative for the exclusive Cult of the Ancestor Moth. The Moth Society has a particular fear and revulsion for Moth-Eaters, and will persecute those whom they believe are guilty of this crime. The Hour of the Moth is the evening. Spirit of cunning, prowess in battle and the hunt. Popular among young warriors, mercenaries, lower ranked Fighters Guild members, Battlemage aristocracy (who do not have ties to the Tsaeci, see the Syff-Etar) and legionaries. In the south-west, the cult is unpopular due to Khajiit association. Known for a specific ritual, called the Citizen's Hunt: once a year, the leaders of the cult come together, select a specific quarry and hunting ground, and invite a selection of the most famous hunters in Cyrodiil to compete. The Jaguars are almost completely free in the selection of quarry and grounds, which has lead to some bizarre situations. The Hour of the Jaguar is the morning. An obscure branch of the Jaguar Cult, though they claim to precede them. The Tigers operate from within the Jaguar cult and select their members in secret. The tiger is long extinct in the jungles of Cyrodiil, and the Nibenese consider it a mythical creature with strange and dangerous powers, comparable to a dragon. The Society of Tigers also has its own exceptional hunt: their quarry is the winner of the Citizen's Hunt. The Hour of the tiger is four o'clock at night. Popular among the Niben's aristocrats and upper-class. Connections to the Fighter's Guild (the Syffim) and to the Tsaeci ancestry of many Nibenese noblemen. More influential and shadowy than most. They are said to have a certain connection to Hircine, and his failed were-crocodile experiment. The Society of Fishes is exclusive to the Niben's poor fishermen. It has a certain rivalry with the farmer's Society of Bulls, though in all aspects the Fishes are inferior. A minor society, popular among thieves and with connections to Nocturnal and the Nightingale Cult. Illegal. A minor society, popular among bandits and a more petty, unprofessional kind of thieves. Draws its inspiration from the bad reputation of Pygmy-Trolls (a kind of small, thievish monkey, rumored to steal children from their cradle). Illegal and somewhat repulsive. gro-Dahl had an interesting text on tattooing across the Empire here. In terms of tattooing as a practice, Empress Kintyra I was a great patron and practitioner of the art. There's also at least one Dibellan saint associated with the art, as well as possibly a Nibenese minor god and cult of tattooers. I had an outline for a hagiography, but cant find it now. Another popular motif of Kynareth is the bird - a cult of eagles or other birds would probably show some overlap. The most prominent of Kynareth's sky spirits is Morihaus himself. The others were never elaborated upon in lore, but would be either nature spirits like Spriggans, or other weird minor deities - as long as it has wings, I guess. 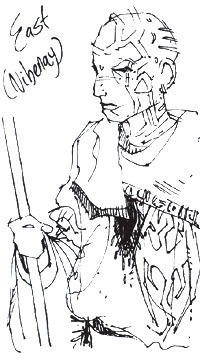 EDIT: this piece of concept art has a depiction of Nibenese tattoos. Cheers Infragris. Decided to split this up a bit more rather than try to complete the entire thing in one sitting, so first up are the Totem Societies. Your draft was awesome btw, though I've changed a few things around so let me know if you're cool with it. Designs for the following tattoos should have natural flowing curves and sometimes crude, primitive imagery. Society of Newts (fishermen): These fishermen paint their bodies in imitation of the nibenese river-newts. It is not uncommon for a western traveller to mistake them at a distance for the lizard-folk of Black Marsh, though the argonians themselves might flinch at the bizarrely bright yellow-green coloring and decoration. Society of Birds (farmers, ties to the Order of Kynareth): Most rice farmers belong to the Society of Birds, and tattoo themsleves with the minor Sky spirits of Kynareth. Alien bird-faces painted in a dark orange cover their skin, though they are prohibited by Law to show Morihaus the Bull. Society of Moths (scholars, ties to the Cult of the Ancestor-Moth): Those scholars and scribes belonging to the Miith-Etar look to their totem for inspiration in subtle tattoos. Splendor-patterns copied from the wings of the native gypsy-moth look from a distance as like a thousand eyes. Society of Jaguars (hunters): Many of the hunters that roam the wild jungles of Cyrodiil are united under the Harn-Etar. They frame their face with paintings of jaguar teeth, and paint a disturbingly long tongue down from their mouth to below their navel. Society of Tigers (warriors): A less public society, the Curc-Etar is popular among low-ranked Fighters Guild members and freelance mercenaries. They tattoo their entire bodies in imitation of the ancient and extinct tigers, orange-red with black stripes. Some paint a flame belowing from their mouth or nostrils. Society of Snakes (akaviri): Few families in the niben are truly descended from the snake-men of akavir, but those that pass the unknown ritual tests of the Elder Council are permitted to join the elusive Syff-Etar. Many of the iconic aristocrat-battlemages of the east are members, and a traveller would be forgiven for fearing to look at their hairless faces of coiled-serpents. Society of Bulls (nobility): Known as Mori-Etar in the east, they are the ruling nobility of the realm and the only society given sanction by the Empire to wear the face of Morihaus. They tattoo the divine bull in shades of red-purple to denote their status. Some particularly respected eastern nobles are descended also from the Tsaeci, and are members of both the Mori and the Syff. Their tattoos are an intricate weave of dancing bull and serpent. Society of Dragons (Order of the Dragon (templars?) -- really needs an -Etar name): Only the royal, dragon-blooded rulers of Empire are hereditary members of this high society, and only they can induct new members. Some have a deep ruby tattoo of the red dragon spanning their entire body, others choose only a small jewel of conquest sitting their forehead. Probably just going to paint examples directly onto the morrowind face and body textures and take shots in-game. I'll get these done at the latest by tomorrow morning. Those guys have a rather shaggy, but fascinating redguard feeling about them. I must say I love the atmosphere in that drawing but I don't know right away how to carry it over to our practical game world. I can say that that body cloth on the left guy is not entirely easy to implement, if the guy is supposed to move it along with his sword arm. I have made something similar for the Reachmen in Skyrim, but it can be difficult to get it working without a lot of bleeding. It most certainly needs some time to find the right bone weight. We could implement it as a tabard instead. Cloaks in general are somewhat outside the scope of this mod. I agree these look really nice though, they evoke exactly the right feeling. Last edited by Ald-Ma' Cyrod on 03 Nov 2014, 23:56, edited 1 time in total. Last edited by Ald-Ma' Cyrod on 15 Jan 2015, 01:11, edited 1 time in total. This stuff is so excellent. I'm really liking your approach for the Ayleid: it's unique, but still close to the old Morrowind aesthetic. cheers jiub. I have to learn more animation anyway so I might give it a try. if it turns out lame ill rig it to the current one. not so good at texture work tho, maybe when its done you could take a look at improving the textures? Awesome, that looks much more appropriate for Cyrodiil than the one we have now- though that one could still be useful as a degenerated/primitive version. And yeah, I was actually going to request the texture work on it just to keep it consistent with the bull we have now.